A common question we get here at River Runners is “ when is the best time to go whitewater rafting?”. The answer can shift from year to year depending on the snowpack and runoff, but you can make an educated decision. Below is a quick guide to help you plan your Colorado whitewater rafting vacation. Let’s start with the basics. While we do offer tours as early as April and float well into September, the best time to raft the Arkansas River is during peak season when the air temps and flows are optimal. Depending on when you book, there may be high water, moderate flows or low water conditions. High water is the most exciting whitewater, but there are great reasons to come any time during peak season. The Arkansas River will have peak runoff from snowmelt around June 15. Rafting the Royal Gorge or the Numbers may be closed during the highest water but this is still the best time for thrill-seekers to raft the Arkansas River. Other sections like Browns Canyon, Bighorn Sheep Canyon and the Narrows offer shock and awe whitewater during this time but the Family Float and Salida Town Run are good options for kids and beginner rafters. Age limits may vary this time of year but we will find an alternate route or provide a refund if safety is a concern. This is still a great time to hit up the Royal Gorge or the Numbers but it’s also a good time for beginners to experience the river. Expect standard age limits on the Browns Canyon and Bighorn Sheep Canyon sections of the Arkansas River. 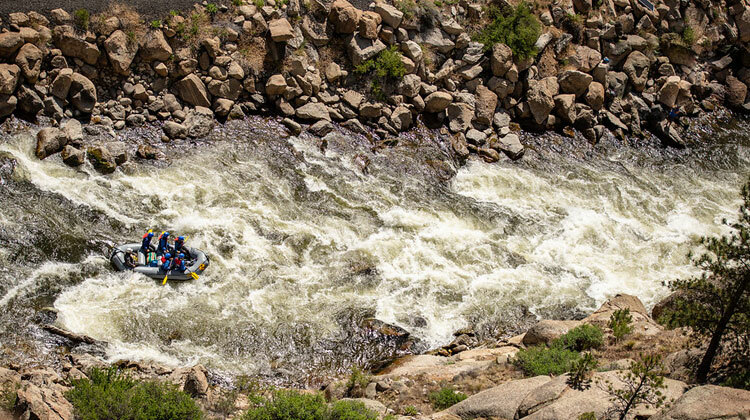 The Numbers closes, but the Royal Gorge still has some amazing whitewater. The Family Float and Bighorn Sheep Canyon are great for beginners while Browns Canyon takes lots of paddling but is well worth the effort. Low water can be extended during droughts, but the Voluntary Flow Management Program runs through August 15 in most years with a target of 700 cubic feet per second (CFS) at the Wellsville Gauge near Salida, Colorado. Now you know when to go, here is a quick guide on what rafting trip is best for your group. Located in the South Main neighborhood of Buena Vista, CO across from the Surf Hotel. One hour and 15 minutes from Breckenridge, two hours from Colorado Springs and two and a half hours from Denver. Located five miles south of Buena Vista, CO at the put-in for Browns Canyon National Monument. One hour and 15 minutes from Breckenridge, two hours from Colorado Springs and two and a half hours from Denver. Located eight miles west of Cañon City, CO at the turn-off to the Royal Gorge Bridge and Park. Two hours from Colorado Springs and two and a half hours from Denver.